Links are the physical cycling infrastructure that join origins to destinations. They can take a variety of forms depending on particular conditions and these are described below in Link Types. This Manual recommends providing for cyclists in a manner that supports and promotes a more sustainable approach to travel. The concepts and details are based on both national and international evidence and feedback. Providing for two abreast where possible – this makes cycling more enjoyable, but the wider cycle facility also makes it safer, more visible and more attractive. 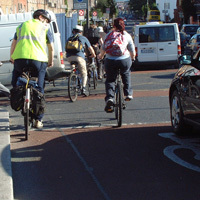 wider cycle facility also makes it safer, more visible and more attractive. This Manual recommends calculating the optimum width required for any given situation using the Width Calculator, and then seeking to establish how it can be accommodated. It is not acceptable to simply provide whatever space is left over after traffic has been catered for – this approach often results in facilities that are substandard and unsafe for cyclists. Substandard facilities have been shown to be dangerous, increasing the likelihood and severity of conflict. It would be better not to provide any cycling facility at all, and to review the overall cycle network. Solutions may include reducing the number of traffic lanes, reducing the design speed of adjoining traffic, or introducing a segregated or off-road cycle facility. The design speed of the adjoining vehicular traffic will inform the choice of link type. Where traffic is low in speed, the speed differential between bicycles and vehicles is small, and cyclists can be safely integrated with the main traffic. As traffic speed increases, the speed differential also increases, and greater degrees of separation and segregation are required. 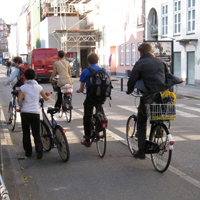 Equally, where traffic volumes are low, such as in residential areas or side streets, cyclists can be integrated with vehicular traffic as long as motorists are aware of the presence of cyclists and will yield to them. In such circumstances, vehicular traffic is not unduly impeded by the presence of cyclists. Where traffic volumes are higher, separate or segregated facilities will be required to ensure that cyclists do not cause traffic queues. See Section 1.7.4 for further information on the appropriate choice of link type for different traffic volumes and speeds. Whether providing a new facility or upgrading and existing one, a realistic budget needs to be made available. Identifying the correct solution in advance is essential. In some cases, the correct solution may in fact be cheaper than a substandard one. An example of this might be a good cycle lane alongside a single traffic lane, as opposed to a narrow cycle lane squeezed in beside two lanes of traffic.